What is the 2 Holster Combo? The 2 Holster Combo is a way for you to save when you bundle two complete holsters at one time. With this combo, you’ll save approximately 20% off your order. What is included in the 2 Holster Combo? 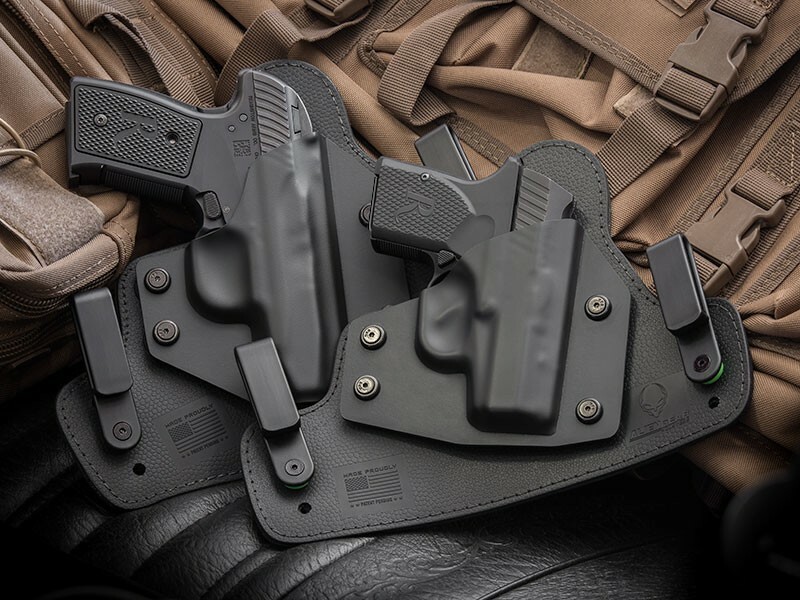 The 2 Holster Combo includes your choice of inside and/or outside the waistband holster types plus your choice of holster base material (leather, which comes in black or tan, or neoprene) and your choice of clips. Is the 2 Holster Combo the same as the Conceal Carry Combo? The 2 Holster Combo is different than the Concealed Carry Combo. 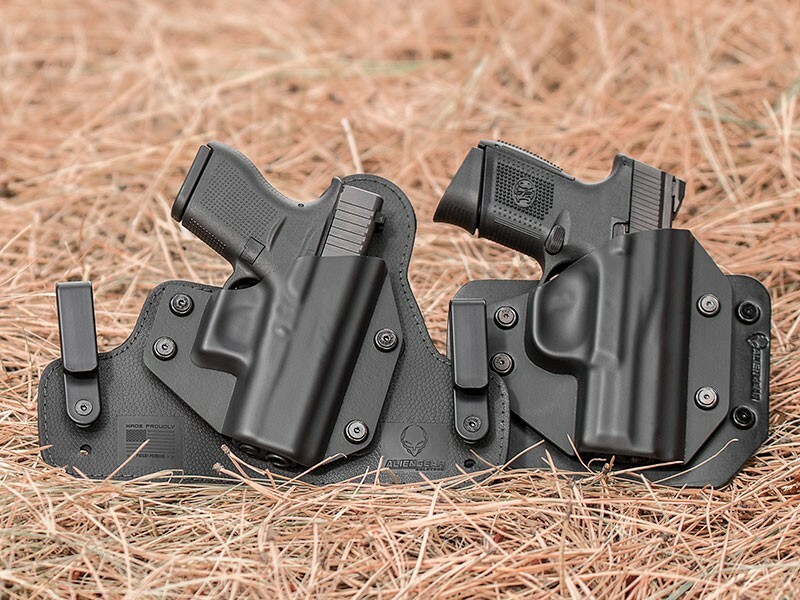 With the 2 Holster Combo, a customer can choose any combination of fully assembled holsters instead of just one IWB holster paired with one OWB holster base. The Concealed Carry Combo is no longer available at this time. Do I have to buy an inside the waistband and an outside the waistband holster for the same gun? The 2 Holster Combo allows you to purchase any two holster styles for any guns you choose. You can now easily bundle two completely different holsters for two completely different guns, or choose two fully assembled holsters for the same handgun. Is this a two for one deal? The 2 Holster Combo is not a two for one deal. Instead, you get a discounted price for buying two holsters at once. You can even bundle a 3rd holster shell for your holsters at a discounted cost. The picture of the 2 Holster Combo shows black and tan. Do I have to get one black and one tan holster? Absolutely not! Choose from any holster backing including leather, which comes in black or tan colors, or our light weight, enhanced comfort neoprene holster base. Mix and match all available colors and holster types! Is $49.88 the final price for the 2 Holster Combo? The 2 Holster Combo features a range of prices. $49.88 is the starting price. Can I upgrade to the 2 Holster Combo if I already have a holster on order? Absolutely! Please contact our customer service team via website chat, phone (208-215-2046) or by using our contact form to change your order. Be sure to have your original order number handy for easy reference. Do you offer the same Iron-Clad Guarantee for the 2 Holster Combo? 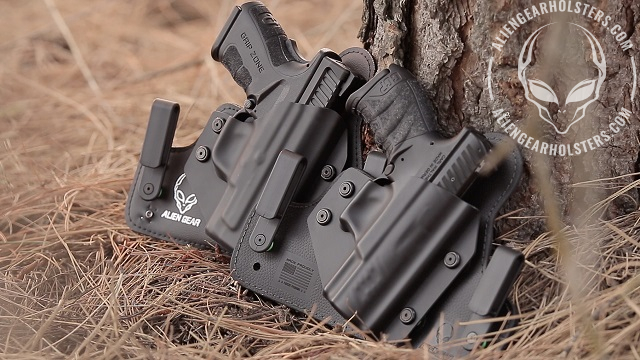 All of Alien Gear Holsters’ products, including the 2 Holster Combo, are backed by our famous Iron-Clad Triple Guarantee, which includes a 30 day trial, free shell trades for life and a forever warranty.